Ryanair, Europe’s No.1 airline, today (23 Aug) announced an investment of $200 million at London Luton airport with 2 new based aircraft (6 aircraft in total) for its winter 2018 schedule and added 6 new routes to Alicante, Athens, Barcelona, Bologna, Cork and Malaga and more flights on its existing Vilnius route. 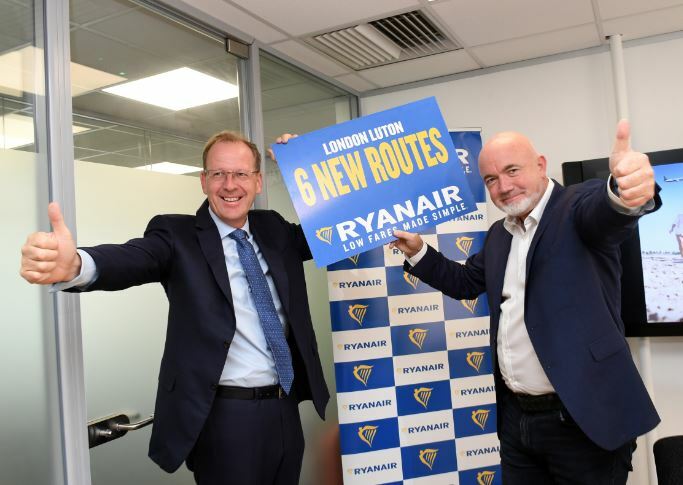 Ryanair’s winter 2018 London Luton schedule will now deliver a total of 21 routes which will help deliver 2.2m customers p.a. “Ryanair is pleased to announce 2 more aircraft at Luton (6 aircraft in total) for our winter 2018/19 schedule. We will deliver 6 exciting new routes to Spain, Greece, Italy and Ireland and have added more flights to Vilnius, as we increase our schedule to 107 weekly flights, carrying 2.2m annual customers to/from London Luton.